If you’ve been living in a cave and isolated from the world for the past couple of weeks, then you may not have been bombarded with coverage of the London 2012 Olympic Games. It’s now well under way, and thousands of athletes are running, cycling, swimming and more in the name of winning a shiny gold medal. None of the Nintendo Life team was quite ready to enter for our respective countries this time, but before we get into training for Brazil 2016 we thought we’d play some appropriate games as a warm up. We haven't seen as many games in this theme as there are sweaty athletes in the Olympic village, but we’re going to endeavour to pick one title that was around for each of the Games since 1988. These aren’t all officially-licensed Olympic games, and one in particular is a rather goofy selection, just as an advance warning. Released in 1987 for NES as an arcade port in North America, this Konami title is fondly remembered by older gamers, though perhaps not by the parents of those that mashed NES controller buttons into dust. If you didn’t have a turbo controller – or something similar – to artificially mash buttons for you, then you were certainly flirting with danger. Some events did require precision, while in others destroying the controller was the key to glory. At least you could enjoy the music made famous by Chariots of Fire if your controllers refused to play any more. Finding good sports/athletics games released around 1992 is actually rather challenging. You should check out YouTube footage of Super Aquatic Games and Alien Olympics 2044 AD for some truly bizarre spin-off games. Track & Field on Game Boy, meanwhile, apparently accompanied the European release of the original NES title, opportunistically renamed Track & Field in Barcelona. As this was on a handheld, it was probably advisable to be a bit more careful with the buttons. Olympic Summer Games on Super NES – and Game Boy – was directly released to coincide with the Atlanta Olympic games. It looks like a game trying to use clever 3D viewpoints to reflect all of that awesome 16-bit power, but seems to be a bit nightmarish to play. It’s not particularly famous or well-loved, as far as we’re aware, but then a lot of games in this genre probably suffer that same fate. By this stage Olympic games were sprinting into a polygon future, and in the case of this title new ways to destroy valuable controllers. Not simply content with button-mashing heroics, Konami insisted on making games rotate joysticks as well, a sure-fire way to form a nice round indent on your palm. In its time the presentation of this one was impressive, and the chap in this video – who shares a nickname with Nintendo Life boss-man Anthony Dickens, hm — may possibly have Usain Bolt quaking in his heavily endorsed boots. OK, so we looked for athletics or Olympics games released on Game Boy Advance, GameCube or anything with a Nintendo logo, that also had some handy footage, and came up empty. Perhaps it was a sign of GameCube’s diminishing relevance in 2004 that the official Athens game was released on PS2 and PC, with no love for everyone’s favourite cubed console. So, yes, here’s 30 seconds of footage for this tenuously linked game. It’s our old friend Konami again, a developer with a heritage in these kind of games unlike any other. 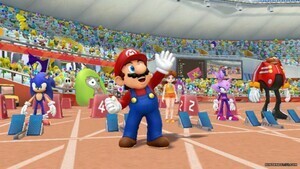 There is at least one member of the Nintendo Life team that remembers New International Track & Field, with a ringing endorsement that it was "pretty good" sending this one to the top step of the podium: it was actually quite well received critically. It was specially developed for DS which means just one thing: tapping and swiping the stylus until the touch screen’s scratches tell you to stop. This was the inevitable entry for this year, especially as it’s been out for a number of months and is still performing remarkably well in the UK charts. It’s not the first time that Mario and Sonic have teamed up of course, and shows that the former rivals have put their differences behind them in the interest of selling lots of licensed games. Available on Wii and 3DS, you can choose whether you fancy waggling a Wii Remote or tapping a stylus and working a Circle Pad. The Wii version in particular promises multiplayer fun, even if it’s not the most accomplished of games. So there you have it, a mix of official Olympic games, some more opportunistic efforts and one that actually has nothing at all to do with Summer Olympic games. Have you played any of these, or perhaps broken a few buttons while playing them? What about World Class Track Meet for the NES and Power Pad?! Where cheating on the jumping events was as easy as stepping off the pad. Good times. "Perhaps it was a sign of GameCube’s diminishing relevance in 2004 that the official Athens game was released on PS2 and PC"
Um, no. Sony just bought the exclusive publishing rights for a console version of Athens 2004. I always liked Crash N the Boys Street Challenge for the NES. While the events were anything but traditional it was still a fun game. It let you get away with stuff that normal Olympic games wouldnt like crashing through hurdles and throwing the pieces at your opponent. IIRC that game is available on the Wii VC too. I liked the games for 2000, 2008 and 2012. OMG, thank you for talking about Track & Field by Konami. Such a great gameeee!!! Did Track & Field on NES ever come out in the UK? I love the sequel and have been hunting for the original since 1991, lol. I've seen Spanish versions (which carries the official Barcelona'92 lisence) and US versions on ebay but never a PAL A version. Oh and International Track & Field 2000 is the best Athletics game ever! I never played anything beyond the DS version of Mario and Sonic, but with the Olympics being so big, gaming companies would be stupid not to release game tie-ins, with some having better gaming quality than others IMO. @noxusprime06 It appears that the last Metroid is NOT in captivity, and that the galaxy is NOT at peace. Activision Decathlon is on the GBA as apart of the Activision Anthology. Wow. You wouldnt see mario and sonic shaking hands 20 years back. Sonic would cream michael phelps at swimming! He would swim so freakishly fast with those super fast legs of his! And mario would destroy all who oppose him at gymnastics! Track and Field 2 is the best Olympic game in my book. Amazing graphics and Konami even threw in arm wrestling as a bonus game. I have to say World Sports Competition on the Virtual console is really good too. NES Track and Field is one of my faves. We played the hell out of that back in the day. But possibly my fave Olympics-game ever (partly due to fond nostalgic memories) was Activision Decathalon for the Atari 2600. There's been some decent Olympic video games. I think my fav has been the Mario and Sonic series, especially the winter olympics one and the latest incarnation. Good controls, good laugh and good social gaming. 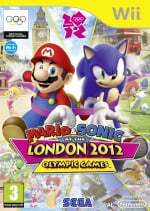 The Mario and Sonic Olympic Winter Games was the best in the whole M&S series. What about all the other Winter Olympics years after they branched off starting in 1994?